Cardiovascular disease is the leading cause of premature mortality in the developed world, and hypertension is its most important risk factor. Controlling hypertension is a major focus of public health initiatives, and dietary approaches have historically focused on sodium. The predominant sources of sodium in the diet, processed foods, are also generally high in added sugars, the consumption of which might be more strongly and directly associated with hypertension and cardiometabolic risk. Clinicians should shift focus away from salt and focus greater attention to the likely more-consequential food additive: sugar. Cardiovascular disease (CVD) is the number one cause of premature mortality in the developed world,1–3 and hypertension is its most important risk factor.4 Hypertension was implicated as a primary or contributing factor in more than 348 000 deaths in the USA in 20095 with costs to the nation in excess of $50 billion annually.6 Controlling hypertension is a major focus of public health initiatives, and dietary approaches to address hypertension have historically focused on sodium. Nonetheless, the potential benefits of sodium reduction are debatable.7–9 Reducing sodium intake may lower blood pressure measurements in some individuals, but average blood-pressure reductions might only be as great as 4.8 mm Hg systolic and 2.5 mm Hg diastolic—being generous (only considering upper confidence limits and only considering persons with hypertension)10—and whether there would be a net health benefit from such reductions is unclear. In fact, there is some evidence suggesting that reducing sodium intake could lead to worse health outcomes, such as increased cardiovascular and all-cause mortality in patients with diabetes,11 and increased hospitalisations and mortality in patients with congestive heart failure.12–15 More importantly, recent data encompassing over 100 000 patients indicates that sodium intake between 3 and 6 g/day is associated with a lower risk of death and cardiovascular events compared to either a higher or lower level of intake.16 ,17 Thus, guidelines advising restriction of sodium intake below 3 g/day may cause harm. Nonetheless, the mean intake of sodium in Western populations is approximately 3.5–4 g/day.20 Five decades worth of data indicates that sodium intake has not changed from this level across diverse populations and eating habits, despite population-wide sodium-reduction efforts and changes in the food supply.21 ,22 Such stability in intake suggests tight physiologic control, which if indeed the case, could mean that lowering sodium levels in the food supply could have unintended consequences. Because processed foods are the principal source of dietary sodium,18 if these foods became less salty, there could be a compensatory increase in their consumption to obtain the sodium that physiology demands. Coincidentally, processed foods happen to be major sources of not just sodium but of highly refined carbohydrates: that is, various sugars, and the simple starches that give rise to them through digestion. Compelling evidence from basic science, population studies, and clinical trials implicates sugars, and particularly the monosaccharide fructose, as playing a major role in the development of hypertension. Moreover, evidence suggests that sugars in general, and fructose in particular, may contribute to overall cardiovascular risk through a variety of mechanisms. Lowering sodium levels in processed foods could lead to an increased consumption of starches and sugars and thereby increase in hypertension and overall cardiometabolic disease (figure 1). Feeding sucrose to rats stimulates the sympathetic nervous system (SNS),25 which leads to increases in heart rate,26 renin secretion, renal sodium retention and vascular resistance.27 All of these effects interact to elevate blood pressure and, indeed, feeding sucrose to rats increases their blood pressure.28–33 Sucrose feeding also induces other changes, like insulin resistance, as part of a broader metabolic dysfunction.28–33 Additionally, the consumption of sugar or HFCS may lead to an increase in blood pressure via other mechanisms, such as hyperleptinaemia, an increase in methylglyoxal, and a reduction in ATP (figure 2).23 Figure 2 describes the possible mechanisms through which fructose may contribute to hypertension. A recent econometric analysis showed that an increase in sugar availability is directly and independently associated with an increase in diabetes prevalence.61 In fact, a 150-kilocalorie/person/day increase in sugar availability was found to be significantly associated with a rise in diabetes prevalence (1.1%, p<0.001). This risk was 11-fold higher compared to 150-kilocalorie/person/day increase in total calorie availability, supporting the notion that sugar may be distinct among calories in its potential detriment to metabolic health. Other dietary guidelines focus not on sugar, but salt. For instance, the 2013 AHA/American College of Cardiology (ACC) Guidelines on Lifestyle Management to Reduce Cardiovascular Risk recommend lowering sodium intake to 2400 mg/day with further reduction to 1500 mg/day in order to promote optimal reductions in blood pressure.98 Such dietary restrictions may not result in benefit, may produce harm, and may distract focus from other white crystals of greater concern.99 Sugar may be much more meaningfully related to blood pressure than sodium, as suggested by a greater magnitude of effect with dietary manipulation.10 ,77 There is no mention in the AHA/ACC guideline of reducing intake of added sugars to a specific level, and this deficiency is concerning. Still, as the most substantial dietary sources of sodium are also often the most substantial dietary sources of added sugars (ie, processed foods), advice to limit sodium consumption could coincidentally result in less sugar consumption as well. Hence even potentially misdirected dietary guidelines could serendipitously result in benefit. High-sugar diets may contribute substantially to cardiometabolic disease. While naturally occurring sugars in the form of whole foods like fruit are of no concern, epidemiological and experimental evidence suggest that added sugars (particularly those engineered to be high in fructose) are a problem and should be targeted more explicitly in dietary guidelines to support cardiometabolic and general health. Added sugars probably matter more than dietary sodium for hypertension, and fructose in particular may uniquely increase cardiovascular risk by inciting metabolic dysfunction and increasing blood pressure variability, myocardial oxygen demand, heart rate, and inflammation. Just as most dietary sodium does not come from the salt shaker, most dietary sugar does not come from the sugar bowl; reducing consumption of added sugars by limiting processed foods containing them, made by corporations would be a good place to start. Indeed, reducing processed-food consumption would be consistent with existing guidelines already in place that misguidedly focus more on the less-consequential white crystals (salt). Future dietary guidelines should advocate substituting highly refined processed foods (ie, those coming from industrial manufacturing plants) for natural whole foods (ie, those coming from living botanical plants) and be more explicitly restrictive in their allowances for added sugars. The evidence is clear that even moderate doses of added sugar for short durations may cause substantial harm. Box 1 provides important take-aways. Higher sugar intake significantly increases systolic (6.9mm Hg) and diastolic blood pressure (5.6 mm Hg) in trials of 8 weeks or more in duration.77 This effect is increased to 7.6/6.1 mm Hg, when studies that received funding from the sugar industry are excluded.
. Correction: actual causes of death in the United States, 2000. JAMA 2005;293:293–4.
. Burden of disease—implications for future research. JAMA 2001;285:535–9.
. Death in the United States, 2009. NCHS Data Brief 2011:1–8.
. Heart disease and stroke statistics—2012 update: a report from the American Heart Association. Circulation 2012;125:e2–220.
. Forecasting the future of cardiovascular disease in the United States: a policy statement from the American Heart Association. Circulation 2011;123:933–44.
. Problems with the American Heart Association Presidential Advisory advocating sodium restriction. Am J Hypertens 2013;26:1201–4.
. Dietary sodium restriction: take it with a grain of salt. Am J Med 2013;126:951–5.
. Population-wide sodium reduction: reasons to resist. Mayo Clin Proc 2014;89:426–7.
. Effects of sodium restriction on blood pressure, renin, aldosterone, catecholamines, cholesterols, and triglyceride: a meta-analysis. JAMA 1998;279:1383–91.
. Dietary salt intake and mortality in patients with type 2 diabetes. Diabetes Care 2011;34:703–9.
. Short-term effects of hypertonic saline solution in acute heart failure and long-term effects of a moderate sodium restriction in patients with compensated heart failure with New York Heart Association class III (Class C) (SMAC-HF Study). Am J Med Sci 2011;342:27–37.
. Changes in brain natriuretic peptide levels and bioelectrical impedance measurements after treatment with high-dose furosemide and hypertonic saline solution versus high-dose furosemide alone in refractory congestive heart failure: a double-blind study. J Am Coll Cardiol 2005;45:1997–2003.
. Effects of high-dose furosemide and small-volume hypertonic saline solution infusion in comparison with a high dose of furosemide as bolus in refractory congestive heart failure: long-term effects. Am Heart J 2003;145:459–66.
. Normal-sodium diet compared with low-sodium diet in compensated congestive heart failure: is sodium an old enemy or a new friend? Clin Sci (Lond) 2008;114:221–30.
. Urinary sodium and potassium excretion, mortality, and cardiovascular events. N Engl J Med 2014;371:612–23.
. Urinary sodium and potassium excretion and risk of cardiovascular events. JAMA 2011;306:2229–38. Centers for Disease Control and Prevention (CDC). Vital signs: food categories contributing the most to sodium consumption—United States, 2007–2008. MMWR Morb Mortal Wkly Rep 2012;61:92–8.
. The population risks of dietary salt excess are exaggerated. Can J Cardiol 2014;30:507–12.
. Can dietary sodium intake be modified by public policy? Clin J Am Soc Nephrol 2009;4:1878–82.
. Trends in 24-h urinary sodium excretion in the United States, 1957–2003: a systematic review. Am J Clin Nutr 2010;92:1172–80.
. An unsavory truth: sugar, more than salt, predisposes to hypertension and chronic disease. Am J Cardiol 2014;114:1126–8:In press.
. Consumption of high-fructose corn syrup in beverages may play a role in the epidemic of obesity. Am J Clin Nutr 2004;79:537–43.
. Stimulation of the sympathetic nervous system during sucrose feeding. Nature 1977;269:615–17.
. Chronic sucrose ingestion induces mild hypertension and tachycardia in rats. Hypertension 1983;5:218–25.
. Enhanced sympathetic nervous system activity. The linchpin between insulin resistance, hyperinsulinemia, and heart rate. Am J Hypertens 1996;9: 1013–17.
. Fructose-induced insulin resistance and hypertension in rats. Hypertension 1987;10:512–16.
. Effects of sucrose ingestion on blood pressure. Life Sci 1982;30:879–86.
. Effect of oral sucrose on blood pressure in the spontaneously hypertensive rat. Metabolism 1981;30:421–4.
. The effects of sucrose and sodium on blood pressures in various substrains of Wistar rats. Lab Invest 1980;43:101–7.
. Fructose-induced hypertension, hypertriglyceridemia and elevated cytosolic calcium in rats: prevention by deuterium oxide. Artery 1994;21:124–47.
. Vanadyl sulfate prevents fructose-induced hyperinsulinemia and hypertension in rats. Hypertension 1994;23:308–12.
. Nocturnal hypertension in mice consuming a high fructose diet. Auton Neurosci 2006;130:41–50.
. Effects of febuxostat on metabolic and renal alterations in rats with fructose-induced metabolic syndrome. Am J Physiol Renal Physiol 2008;294:F710–18.
. Increased fructose associates with elevated blood pressure. J Am Soc Nephrol 2010;21:1543–9.
. Sugar-sweetened beverages, serum uric acid, and blood pressure in adolescents. J Pediatr 2009;154:807–13.
. Added sugars in the diet are positively associated with diastolic blood pressure and triglycerides in children. Am J Clin Nutr 2014;100:46–52.
. Hypertension and associated metabolic abnormalities—the role of insulin resistance and the sympathoadrenal system. N Engl J Med 1996;334:374–81.
. Dietary sucrose and the behaviour of blood platelets. Proc Nutr Soc 1970;29:Suppl:3A.
. Serum insulin and glucose in hyperinsulinemic subjects fed three different levels of sucrose. Am J Clin Nutr 1981;34:2348–58.
. Insulin and atheroma. Lancet 1969;1:1211–12.
. Dietary carbohydrates and insulin sensitivity: a review of the evidence and clinical implications. Am J Clin Nutr 1997;66:1072–85.
. Insulin resistance, hyperinsulinemia, and hypertriglyceridemia in the etiology and clinical course of hypertension. Am J Med 1991;90:7s–12s.
. Isocaloric exchange of dietary starch and sucrose in humans. II. Effect on fasting blood insulin, glucose, and glucagon and on insulin and glucose response to a sucrose load. Am J Clin Nutr 1979;32:2206–16.
. Effects of dietary fructose on plasma glucose and hormone responses in normal and hyperinsulinemic men. J Nutr 1983;113:1819–26.
. Insulin sensitivity of adipose tissue of rats fed with various carbohydrates. Proc Nutr Soc 1974;33:4a–5a.
. Insulin and the sympathetic nervous system in the pathophysiology of hypertension. Blood Press Suppl 1996;1:25–9.
. Pathophysiology of obesity-related hypertension: role of insulin and the sympathetic nervous system. J Cardiovasc Pharmacol 1994;23(Suppl 1):S1–8.
. Obesity-related metabolic syndrome: mechanisms of sympathetic overactivity. Int J Endocrinol 2013;2013:865965.
. Insulin resistance in essential hypertension. N Engl J Med 1987;317:350–7.
. Resistance to insulin-stimulated-glucose uptake in patients with hypertension. J Clin Endocrinol Metab 1988;66:580–3.
. Role of methylglyoxal in essential hypertension. Int J Angiol 2010;19:e58–65.
. Some aspects of hypertension in diabetes mellitus. JAMA 1967;202:104–10.
. Diabetes and hypertensive vascular disease. Mechanisms and treatment. Am J Cardiol 1973;32:592–606.
. Prevalence of hyperinsulinaemia in patients with high blood pressure. J Intern Med 1992;231:235–40.
. Insulin resistance is a characteristic feature of primary hypertension independent of obesity. Metabolism 1990;39:167–74.
. Effect of interchanging bread and sucrose as main source of carbohydrate in a low fat diet on the glucose tolerance curve of healthy volunteer subjects. Am J Clin Nutr 1966;19:59–62.
. Sugar and disease. Nature 1972;239:197–9.
. The relationship of sugar to population-level diabetes prevalence: an econometric analysis of repeated cross-sectional data. PLoS ONE 2013;8:e57873.
. Added sugar intake and cardiovascular diseases mortality among US adults. JAMA Intern Med 2014;174:516–24.
. Intake of added sugars and selected nutrients in the United States, National Health and Nutrition Examination Survey (NHANES) 2003–2006. Crit Rev Food Sci Nutr 2010;50:228–58.
. Sugar-sweetened beverage, sugar intake of individuals, and their blood pressure: international study of macro/micronutrients and blood pressure. Hypertension 2011;57:695–701.
. Impact of sugar-sweetened beverages on blood pressure. Am J Cardiol 2014;113:1574–80.
. Fructose content in popular beverages made with and without high fructose corn syrup. Nutrition 2014;30:928–35.
. Sugar content of popular sweetened beverages based on objective laboratory analysis: focus on fructose content. Obesity (Silver Spring, Md) 2011;19:868–74.
. Sweetened beverage consumption and risk of coronary heart disease in women. Am J Clin Nutr 2009;89:1037–42.
. Sweetened beverage consumption is associated with increased risk of stroke in women and men. J Nutr 2014;144:856–60.
. Fructose-rich beverages and risk of gout in women. JAMA 2010;304:2270–8.
. Intake of sugar-sweetened beverages and weight gain: a systematic review. Am J Clin Nutr 2006;84:274–88.
. Soda and other beverages and the risk of kidney stones. Clin J Am Soc Nephrol 2013;8:1389–95.
. Mortality due to sugar sweetened beverage consumption: a global, regional, and national comparative risk assessment. Circulation 2013;127:AMP22.
. Serum uric acid, inorganic phosphorus, and glutamic-oxalacetic transaminase and blood pressure in carbohydrate-sensitive adults consuming three different levels of sucrose. Ann Nutr Metab 1983;27: 425–35.
. Dietary sugars and cardiometabolic risk: systematic review and meta-analyses of randomized controlled trials of the effects on blood pressure and lipids. Am J Clin Nutr 2014;100:65–79.
. Sucrose compared with artificial sweeteners: different effects on ad libitum food intake and body weight after 10 wk of supplementation in overweight subjects. Am J Clin Nutr 2002;76:721–9.
. Short-term effects of various sugars on antinatriuresis and blood pressure changes in normotensive young men. Am J Clin Nutr 1983;38: 84–94.
. Absorption capacity of fructose in healthy adults. Comparison with sucrose and its constituent monosaccharides. Gut 1986;27:1161–8.
. 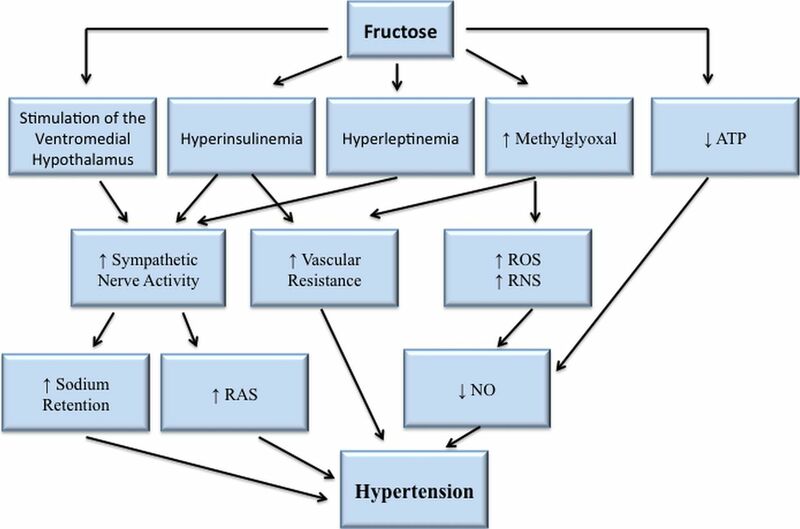 Effects of high-fructose corn syrup and sucrose on the pharmacokinetics of fructose and acute metabolic and hemodynamic responses in healthy subjects. Metabolism 2012;61:641–51.
. Fructose ingestion acutely elevates blood pressure in healthy young humans. Am J Physiol Regul Integr Comp Physiol 2008;294:R730–7.
. Effects of visit-to-visit variability in systolic blood pressure on macrovascular and microvascular complications in patients with type 2 diabetes mellitus: the ADVANCE trial. Circulation 2013;128:1325–34.
. Physiological correlates of beat-to-beat, ambulatory, and day-to-day home blood pressure variability after transient ischemic attack or minor stroke. Stroke 2014;45:533–8.
. Relationship of 24-hour blood pressure mean and variability to severity of target-organ damage in hypertension. J Hypertens 1987;5:93–8.
. Excessive fructose intake induces the features of metabolic syndrome in healthy adult men: role of uric acid in the hypertensive response. Int J Obes (Lond) 2010;34:454–61.
. Low-fructose diet lowers blood pressure and inflammation in patients with chronic kidney disease. Nephrol Dial Transplant 2012;27:608–12.
. Some biochemical effects of a mainly fruit diet in man. S Afr Med J 1971;45: 253–61.
. The effect of two energy-restricted diets, a low-fructose diet versus a moderate natural fructose diet, on weight loss and metabolic syndrome parameters: a randomized controlled trial. Metabolism 2011;60:1551–9.
. Pure, white and deadly. Penguin Books, 2012. Strom S. U.S. Cuts Estimate of Sugar Intake. The New York Times 26 October 2012.
. Hyperinsulinemic diseases of civilization: more than just Syndrome X. Comp Biochem Physiol A Mol Integr Physiol 2003;136:95–112. http://www.sugarstacks.com (accessed 27 Aug 2014).
. Is dietary carbohydrate essential for human nutrition? Am J Clin Nutr 2002;75:951–3; author reply 3–4.
. Dietary sugars intake and cardiovascular health: a scientific statement from the American Heart Association. Circulation 2009;120:1011–20.
. Dietary reference intakes for energy, carbohydrate, fiber, fat, fatty acids, cholesterol, protein and amino acids. J Am Diet Assoc 2002;102:1621–30.
. 2013 AHA/ACC Guideline on Lifestyle Management to Reduce Cardiovascular Risk: A Report of the American College of Cardiology/American Heart Association Task Force on Practice Guidelines. J Am Coll Cardiol 2013;63(25 Pt B):2960–84.
. Attempting to reduce sodium intake might do harm and distract from a greater enemy. Am J Public Health 2013;103:e3. Contributors JJD conducted the literature review, conceived the paper, and drafted the main arguments. SCL helped revise and reorganise the arguments, modified the framing, and recast the introduction and discussion. JJD and SCL cowrote the final paper.